Here’s one of the modern breed of American fast cars – the Panoz Esperante GT, which combines the traditional V-8 with some modern technology. And the engine is not bad either. 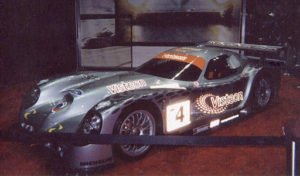 The Panoz has an interesting construction. It consists of the center section of a Ford Mustang underbody and aluminum extrusions. This is fairly light and rigid, and less expensive to produce than carbon fiber. With its modern/trad lines, the Esperante is a great-looking two seater convertible. 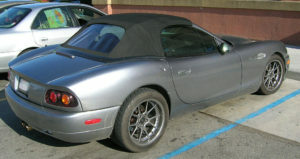 There are two roadsters, the Esperante and Esperante GT, which is lighter. There is also the supercharged GT-LM coupe or convertible, which has improved aerodynamics. All the cars share the same basic lines and layout, with a ‘coke bottle’ side line, and with fenders that project forward of the main grille. The headlamps fit flush with the fenders. Power comes for various versions of Ford 4.6 liter V-8, 32-valve engine. In the Esperante and GT this engine develops a healthy 305 bhp at 5,800 rpm, with maximum torque of 320 lb ft (434 Nm) at 4,200 rpm. This is actually about the same as you get in the current Mustang, so for the GT-LM more power is added with the aid of a supercharger. This pushes the power up to 420 bhp at 6,000 rpm and torque to 390 lb ft (530 Nm) at 3,500 rpm, which give the GT-LM the grunt to hold its own with the Corvette and other supercars. Surprisingly, this version uses the cast iron block to give more durability. You get a five-speed manual box as standard with a four-speed automatic as an option, but the GT-LM gets a six-speed box, which is almost obligatory with that sort of performance. At the front and rear are sub-frames to carry the suspension and the axle gears. Tubular double wishbone suspension is used front and rear, the geometry being modelled on that of racing cars. 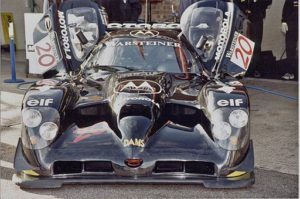 However, the GT-LM is closer still to race car suspension of the works cars. Gas-filled dampers and coil springs are used, while there is a tubular anti-roll bar at the front only. Despite the twin front airbags, ABS, traction control and a limited slip diff, none of the Esperantes is overweight, with the GT weighing in at 3,197 lb (1,450 kg) and the GT-LM weighing 3,384 lb (1,536 kg), which competes with the Corvette at 3,245 lb, and the new Jaguar XK at 3,513 lb. The Panoz Esperantes are good-looking supercars at reasonable prices and with plenty of performance. Of course, the supercharged engine in the GT-LM has plenty of scope for more power if that’s what you want – 500 bhp is definitely available. 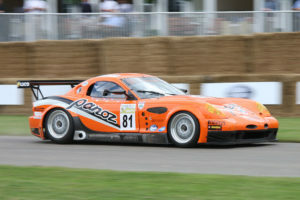 John Hartley is editor of http://www.fast-autos.com, an online magazine devoted to fast cars and supercars. He has written from many of the world’s top auto magazines, and has written many books about cars and the auto industry, including ‘Suspension and Steering Q&A’ and ‘The Electronics Revolution in the Motor Industry’.